1. I guess I would start out by saying that holidays are important. It is important to remember certain historical and religious events and it is important to reflect on this yearly touchstones of life as we journey through life. If we can share these special times with family and friends- all the better. 2. But as I grow older I am finding that I dislike the expectation of the holidays more and more. Certainly the culture puts a lot of pressure on the holidays, particularly Thanksgiving and Christmas, that they be filled with a lot of stuff, more-than-you-should-eat food and that you have to be just over-the-top happy and filled with joy. I think we're very lucky if we hit these expectations a handful of times in the average lifetime. The rest of the time I think if we just have "nice" or "enjoyable" or just "pleasant," it doesn't seem as if the day (and make no mistake in the culture Thanksgiving is one day and Christmas is one day and there is a big season of SHOPPPING in between)was really successful and there can be a sense of let down. 3. There is nothing wrong with a holiday that is simply, nice, enjoyable or pleasant. Bigger is not always better. 4. One little bit of middle-aged life that no one tells you is - after a certain point there will always be a tinge of sadness to the holidays. That magical feeling from childhood will never be what it once was. Part of that is because it is now our sole turn to MAKE the magic happen. We do the shopping, we do the wrapping, we do the cooking and cleaning and make all the lists etc. This all gets done in addition to the regular every-day work and life stuff that we are obligated to do anyway. We do it willingly and with love for our family, friends and community. It is added burden and stressful nonetheless and I think it's important to recognize that and to cut ourselves a little slack! 5. There is also the small sorrow that the people we once shared these days with have gone to their graves. Nostalgia is a wonderful and beautiful thing. It is also a little painful. But I think it is painful because we loved. Love and Loss are first cousins me thinks. The sense of loss is like a hollow feeling inside of me, and yet I know it exists because it was and even still is, a place of love. This year we tried to incorporate our past with the present. 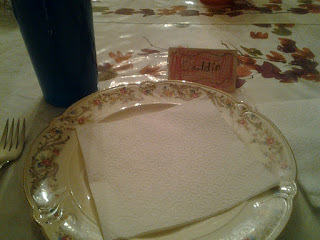 I used mom's china for dinner. 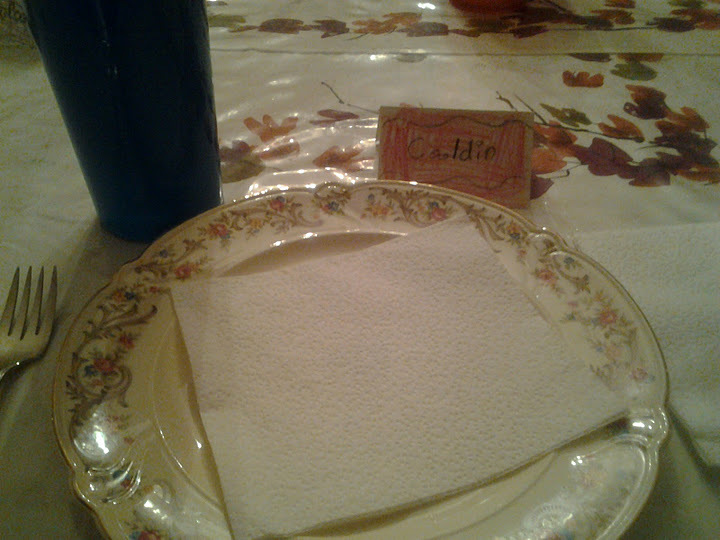 She only had 8 place settings so I used a few of my grandma's pieces to fill out the table. 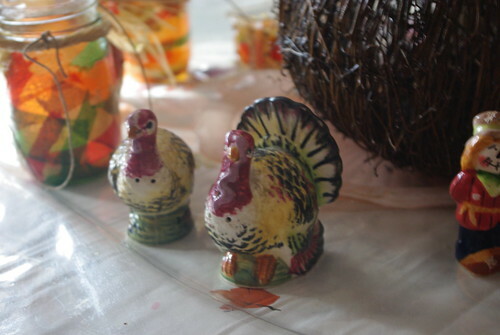 We used my mother-in-law's turkey salt and peppers to bring in that part of the family too. 6. This year Mr. Pete and I are navigating transitional waters, waters that stretch out in front of us for 20 years or more as children get older, start relationships and then try to navigate the holiday time between two or more homes. We have six kids - that is potentially six other families to try to work a holiday around in addition to my only sibling and her family which is also looking at splits or divides. 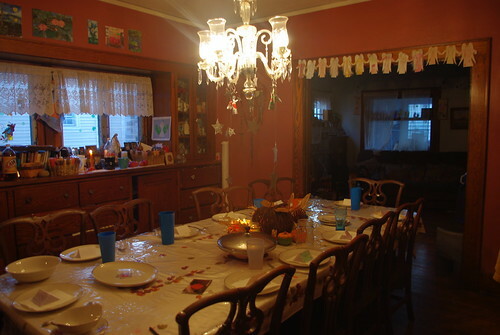 What I wanted to do (and have wanted to do for a few years now) is to just have a holiday party on Friday of Thanksgiving and have well known that no matter what, even if it is just for a few moments, our house is the place to be for food, fun and good cheer. The house just isn't up for it yet (leaky roof and a rotting out sink countertop!) but I think that's the way to go for next year. 7. Definitely think doing something outside of the house adds to the holiday. 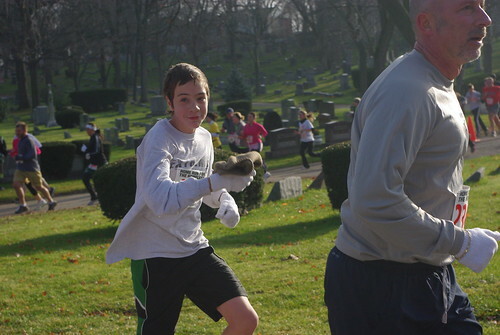 This is our second year for the Run for the Homeless and it has been good for us as a family. Next year, I think Rosie and I will try to the one-mile fun run just to get started. We shall see. I just discovered your blog from your post at Fr. Longneckers. I too have thought about the difference in holidays as one gets older. I agree with so much of what you say. It's nice to know I'm not the only one. I like your #3 commentary the most. It fits the way I feel.